Viewing topic "MOTIF XS8 for Sale"
I have an Excellent condition Motif XS8 for sale. No dings. No Scratches. No dents. No missing knobs or faders, all keys & functions work. Upgraded with 1GB RAM and updated with latest Firmware. Keyboard used in smoke-free home and brought to church about once a month for about 1 year (Worship Team)… lightly used. 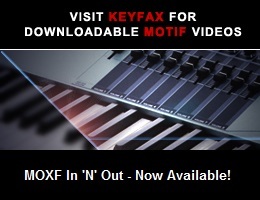 I will include the “World of Motif XS” DVD with it. I am interested in getting a S70XS, so must sell the Motif… Would like to limit the sale/delivery of the Motif LOCALLY WITHIN ORANGE COUNTY OR LA COUNTY, CA to eliminate having to ship the unit.